John Clague studied at the Cleveland Institute of Art (BFA with honors, 1956) under Edris Eckhardt, Walter Sinz, Walter Midner, John Bergschneider, Julius Schmidt, and William McVey. As a fourth-year student he was awarded a Yale/Norfolk Fellowship and upon graduation, spent an eye-opening year in Europe as a Catherwood Foundation Traveling Fellow. His career was spent teaching sculpture at Oberlin College and the Cleveland Institute of Art. 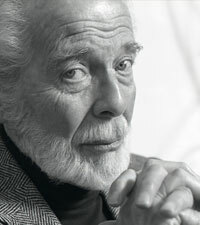 Before retiring in 1971, Clague became the chairman of the Department of Sculpture for the Cleveland Institute of Art. Clague’s sculptures have been exhibited in the Whitney Annual Exhibition of Contemporary American Sculpture and in twenty eight May Shows at the Cleveland Museum of Art. He is represented in the permanent collections of the CMA (six sculptures including his 1960 bronze Flower of Erebus and his 1963 Plexiglas Progression in Black and White), the Art Gallery of Ontario, the Aldrich Museum of Contemporary Art, the University of Massachusetts, and the Williams College Museum of Art. His work is documented in the Archives of American Art of the Smithsonian Institution in Washington, D.C., and represented in The Sculpture of the End of the 19th and the 20th Centuries (Éditions Rencontre, Paris, 1966/67). John Clague is best known for his monumental sculptures – bold, airy, and abstract forms in bronze, steel, and fiberglass. He used light to play with the surfaces of his sculptures, using black and white, multiple colors, and occasionally polished them to a shine.